KMS offers the unique "XR" series bearing style with 4-point contact deep ball groove geometry. This ball groove design enables the bearing to handle simultaneous radial, axial and moment loading while maintaining stiffness. As a bonus they also have minimal radial and axial play. The "XR" groove design will not lock up in the presence of off center loads. The load and speed calculations are for reference only. 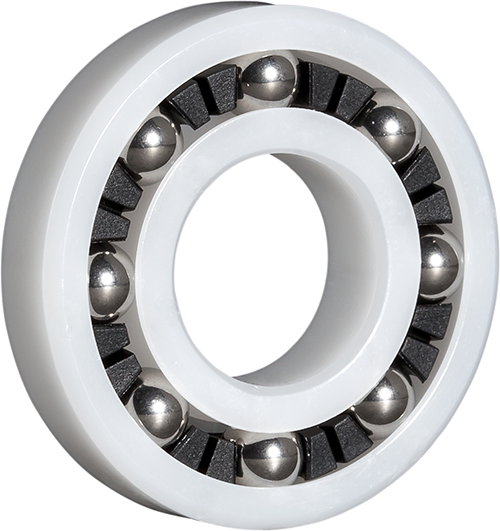 The “XR” KMS Plastic Ball Bearing features Celcon® Acetal (POM) for races and ball retainer, and is fitted with 316 stainless balls. When Acetal plastic is not the right fit we have additional standard materials, Kynar® and PEEK, which offer additional benefits. For a list of alternative materials that are available see Semi-Custom Bearings. KMS recommends testing in actual conditions expected in the applications. The information presented here is believed to be accurate at time of publication but is subject to change without notice. These are made to order and minimum quantities may apply.